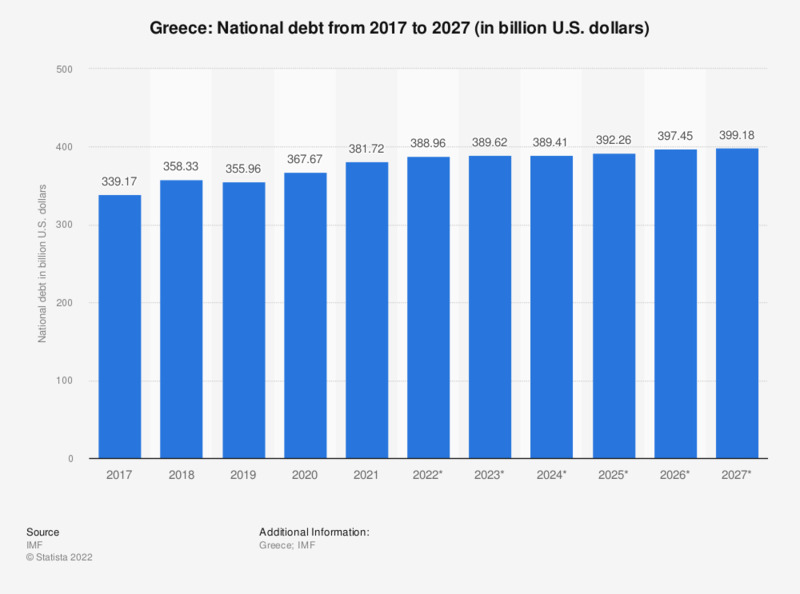 This statistic shows the national debt of Greece from 2012 to 2017, with projections until 2022. In 2017, the national debt in Greece was around 365.57 billion U.S. dollars. In a ranking of debt to GDP per country, Greece is currently ranked second. Greece is a developed country in the EU and is highly dependent on its service sector as well as its tourism sector in order to gain profits. After going through a large economic boom from the 1950s to the 1970s as well as somewhat high GDP growth in the early to mid 2000s, Greece’s economy took a turn for the worse and struggled intensively, primarily due to the Great Recession, the Euro crisis as well as its own debt crisis. National debt within the country saw significant gains over the past decades, however roughly came to a halt due to financial rescue packages issued from the European Union in order to help Greece maintain and improve their economical situation. The nation’s continuous rise in debt has overwhelmed its estimated GDP over the years, which can be attributed to poor government execution and unnecessary spending. Large sums of financial aid were taken from major European banks to help balance out these government-induced failures and to potentially help refuel the economy to encourage more spending, which in turn would decrease the country’s continuously rising unemployment rate. Investors, consumers and workers alike are struggling to see a bright future in Greece, whose chances of an economic comeback are much lower than that of other struggling countries such as Portugal and Italy. However, Greece's financial situation might improve in the future, as it is estimated that at least its national debt will decrease - slowly, but steadily. Still, since its future participation in the European Union is in limbo as of now, these figures can only be estimates, not predictions.